so here's the thing...i love to cook. but when it's 85 degrees and so sticky-gross-humid that it's impossible to breathe without sweating, i tend to lose interest. but a girl's still got to eat, and i can only order takeout so many times in one week before i start to feel supremely guilty about it...and a little blah and lethargic from the extra fat, salt, sugar, and who knows what else. i wish i were more into salads, but i'll admit that i'm not. on occasion, they're wonderful, but often, i just don't feel satisfied after eating a big plate of greens—i need something more satiating. enter, the magical, wonderful, insanely easy dish that is pesto. this recipe is so insanely simple, i'm not even going to write out numbered direction steps like i usually do—you really don't need them. put the nuts in a food processor and chop until fine. add all the other ingredients except the olive oil (working in batches, if your processor is small) and blend until everything is finely chopped and well combined. stream in the olive oil and blend again. and you're done! 5 minutes, less than 10 ingredients, and absolutely no heat required. and of course, this pesto is absolutely delicious on pasta, so i'm going to give you a great summer pasta-making tip/quick recipe for that, too! this does require turning on the stove (sorry), but only for about 10 minutes, and you only need one pot. if you're going to go so far as to actually cook something in the stifling summer heat, this is the way to go. put on a big pot of salted water and bring it to a boil. when water comes to a rolling boil, add your pasta of choice. i used mezzi rigatoni here, because whenever i'm eating pesto, i like to use a pasta with some real texture to it, and rigatoni has those lovely ridges you see above—it really holds onto the sauce, meaning you get more of that herby, garlicky goodness in each bite. When pasta has approximately 3 minutes of cooking time left (check the package of your particular brand/type of pasta to see exactly how long it needs to be cooked), add in some fresh and frozen veggies that will quickly blanch in the hot water. I used some thickly sliced zucchini and sweet corn (because it's summer! ), but you can use whatever you have handy. really hearty veggies, like broccoli, cauliflower, or carrots may need an extra minute (unless you like them pretty crunchy). when veggies are just cooked through and pasta is al dente, dump everything into a colander to drain, and rinse it immediately with cold water to stop it cooking further. put the veggies and pasta back into your pot, then toss with the pesto. if you like, you can also add some fresh veggies here (i put in chopped tomato). 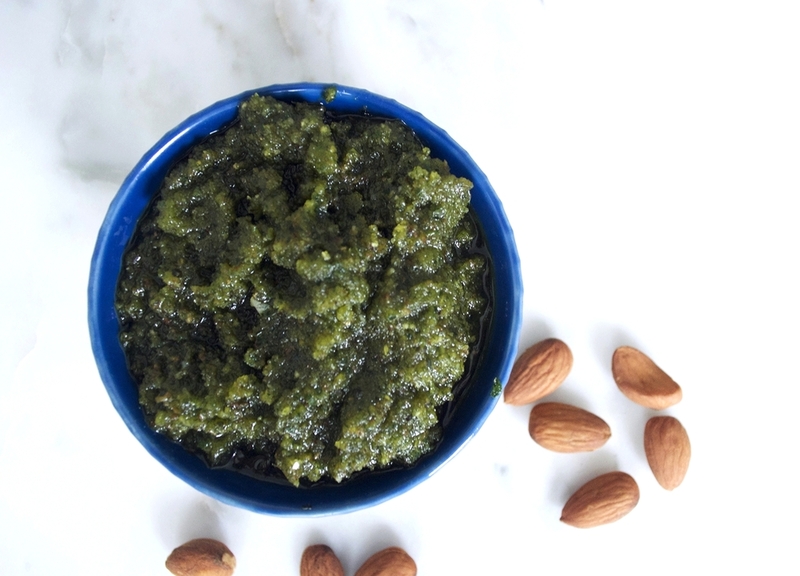 i make my pesto quite thick (i also like to use it as a sandwich spread sometimes, in place of mayo), so you may want to throw in a tablespoon or two of additional olive oil to make it saucier (although that's entirely up to you). and voilà! you've got a gorgeously green, fresh summer dinner really quickly, and you don't have to stand over a hot stove for more than a few minutes. you're welcome.